Sticky. Glossy. Sweet. Tender. Easy. Addictive. 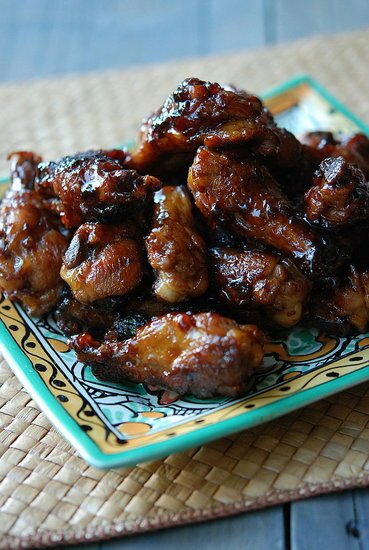 Recipe for One-Pot Sticky Chicken Wings at Food & Wine Magazine/Andrew Zimmern’s Kitchen Adventures. They are yummy, Lea Ann, one of my family's fave AZ recipes. Easy too! U love the dish the stcky chicken is in! Where did u get it? I actually made this recently. I wasn't sure if my cooking skills were up to par since I'm not the greatest cook in the world. I made sure to follow your recipe exactly and guess what? It came out very good. I surprised myself. Made me feel like such a confident cook....haha I will for sure make them again! Yum! These look awesome! The ingredient list looks great too. I am planning to try these soon. I am always looking for ways to make a variety of foods or at least make the same ones taste different! lol I have a feeling these are going to go over well in my house! Wings are a favorite anyway!! These are both of those things, for sure. Yu-um. Ohhhhhh my...yum! I love me some good sticky wings! !